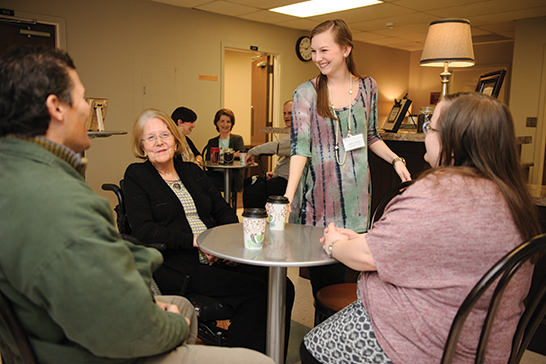 Bama Perks is a coffee shop at UA’s Speech and Hearing Center that is designed to help aphasia clients get their confidence back. 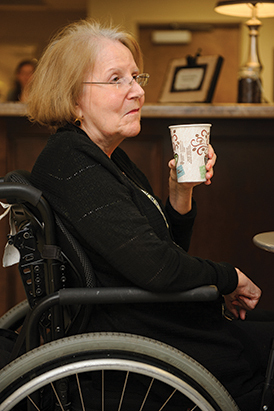 From the 2016 Celebrating Excellence | Prior to her stroke, Nancy Taylor, a client at the Speech and Hearing Center at The University of Alabama, loved learning. She was social and vibrant, and then one day—the day she had her stroke—she lost her ability to talk. Taylor has aphasia, an acquired language disorder, and until recently she relied solely on individual sessions with UA clinicians for her language therapy. But with the opening of Bama Perks, a coffee house for aphasia clients, Taylor and many others are able to get more than just their language back; they’re getting their lives back. Bama Perks gives clients the opportunity to put the skills they learn in their therapy sessions into real-life practice. They order their own coffee; sit down with other clients, students, and clinicians to drink it; and have casual conversations. “We’re hoping to help them gain the confidence to talk to lots of individuals and to do community activities that they had lost interest in doing—or even had a fear of doing,” Ray-Allen said. “We want them to be comfortable enough to go to a restaurant and order something off the menu or go to a drive-through—the things that clients tell me on a day-to-day basis that they struggle with,” she added. Ray-Allen came up with the idea for Bama Perks after learning about the home-like clinic called the Aphasia House at the University of Central Florida. Her adaptation of the house was realized when UA clients and their visitors entered the coffee shop for the first time in February. The shop is open to clients and their visitors Tuesday through Thursday from 9-12, free of charge. It has two coffee pots, offering regular and decaf each day, with a lot of different flavor options as well. To test how well the coffee shop is actually working as contextualized therapy for the clients, graduate student Marie Tucker has taken on Bama Perks for her master’s thesis. As part of her research, Tucker measures various aspects about the participants—their quality of life, the amount of interaction that they have outside of therapy, and their language capabilities—but she will also design protocols for how Bama Perks and future aphasia coffee shops should be run. One of the many ways she gathers data is from the clinicians and research assistants. Clients with aphasia come to Bama Perks to practice the skills they learn during therapy in a simulated real-life situation. While at the coffee shop, the students and clinicians talk to the clients naturally, without pen and paper, and then after their conversation, the clinicians move to an adjoining room to transcribe their mental notes about the interaction. At the end of the semester Tucker will collect all the accrued data and then analyze it over the summer to make her conclusions.  Bama Perks has received grant funding from the College Academy of Research, Scholarship, and Creative Activity through the College of Arts and Sciences as well as monetary support from the department itself. Its student association, the National Student Speech Language Hearing Association, has also offered to purchase some patio furniture to help expand the coffee shop into the outdoor atrium at the Speech and Hearing Center. For clients like Taylor and Jason McNeil, the shop is already making a difference.